QoS (Quality of Service) features enable network managers to decide on packet priority queuing. Differentiated Services (DiffServ, or DS) is a protocol for specifying and controlling network traffic by class so that certain types of traffic (for example voice traffic which requires a relatively uninterrupted flow of data) might get precedence over other kinds of traffic. https://tools.ietf.org/html/rfc2474 for the definition of the Differentiated Services Field (DS Field) in the IPv4 and IPv6 Headers. https://en.wikipedia.org/wiki/Differentiated_services for the differentiated services. You must have a Network Interface created. Go to Network /QoS . In the Differentiated Services Field Configuration table, complete the fields as required, in order to define the default Differentiated Services value for all generated IPv4 packets and the default Traffic Class value for all generated IPv6 packets. For specific services (Signaling, Voice, T.38) above values can be overridden by setting the specific service class values. Refer to Overriding the DiffServ and QoS Service Class Default Values . The unit will apply the specified values as default values for all generated IPv4 and IPv6 packets respectively. The 802.1Q standard recommends the use of the 802.1Q VLAN tags for Ethernet frames traffic prioritisation. VLAN tags are 4-byte headers in which three bits are reserved for priority indication. The values of the priority bits shall be provisioned. The VLAN ID part of the 802.1Q tag is always set to 0. In the Ethernet 802.1Q Tagging Configuration table, select Enable for each interface on which you want to enable user priority tagging. Set the Default User Priority value each interface uses when tagging packets in the Default User Priority column. For specific services (Signaling, Voice, T.38) you can override the values above by setting specific service class values. Refer to Overriding the DiffServ and QoS Service Class Default Values . The selected Default User Priority values will be applied to the Physical Links (VLAN ID = 0) for which the 802.1Q tagging is set to Enable . Go to Network /VLAN . Under the Link column, select the physical link to which you want to add a VLAN. Under the VlanId column, define the number of the VLAN you wish to create. Click + located on the right hand side of the screen. Under the Default User Priority column, set the User Priority for the respective VLAN. For specific services (Signaling, Voice, T.38) you can override the above values by setting specific service class values. Refer to Overriding the DiffServ and QoS Service Class Default Values . The value of the Default User Priority column will be applied to the newly created VLAN. Under the Default User Priority column, set the User Priority to the respective VLAN. The value of the Default User Priority column will be applied to the existing VLAN. 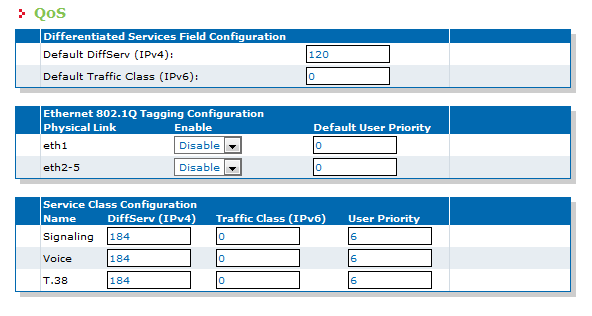 In the Service Class Configuration table, for each service class, set for IPv4 packets the DiffServ value or the Traffic Class value for IPv6 packets, . Set a specific User Priority for each class under the User Priority column. The values set for the DiffServ or the Traffic Class parameters will override any value already specified for the service class (Signaling, Voice, T.38). It is possible to apply bandwidth limitations to the network interfaces. The limitations are applied on the raw data of the physical link and not only on the payload of the packets. All headers, checksums and control bits (TCP, IP, CRC, etc.) are considered in the actual bandwidth. A bandwidth limitation is applied on a physical link and not on a virtual network interface. All high-level network interfaces (including VLANs) using the same physical link are affected by a configured limitation. This limitation is applied to outgoing traffic only (egress). Bandwidth limitation is an average of the amount of data sent per second. Thus, it is normal that the unit sends a small burst of data after a period of silence. Starting the NTC service enables Traffic Shaping even if bandwidth limitation is disabled. The NTC service sends packets on the physical link according to their respective priorities. The lower the value, the higher the priority. Packets with lower priority are dropped first. 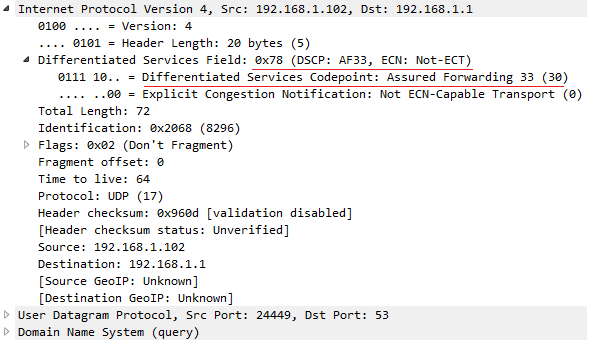 In the User Service table, click located on the same line as Network Traffic Control (NTC). The Network Traffic control (NTC) line will turn to blue, and the Status field will indicate Started . The Network Traffic Control (NTC) service must be enabled. Refer to Enabling the Network Traffic Control (NTC) Service . In the Network Traffic Control Configuration , set the Egress Limit field for the selected link interface. The defined egress limit is applied on the respective ETH interface. 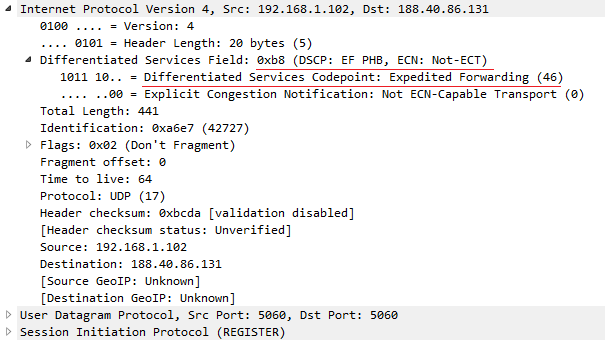 Any IPv4 packet sent from the unit has the value applied in the Default DiffServ (IPv4) field of the Differentiated Services Field Configuration table under Network /QoS tab. This default value is overridden on what concerns the specific service classes defined under the same area and in the Service Class Configuration table.